Select this level if your student can use two or more words (or pictures) to communicate. Additionally, your student should be able to label objects, identify numbers and letters, identify a few words by sight reading, and follow most classroom routines with verbal directions or picture schedule. * play interactively with peers. 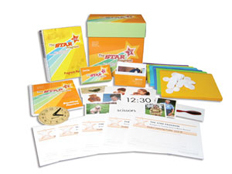 Level III Complete Kit includes: Color coded folders printed with lesson details; Black Line Masters book with reproducible forms, customizable lesson plans and student worksheets; Student Learning Profile (5); flashcards and photo cards; manipulatives; a Program Manual covering all three levels of the STAR Program and a sturdy storage box.